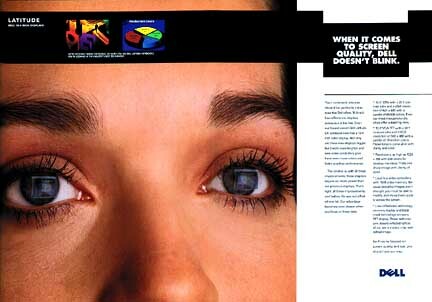 Print ad; click for expanded view. Direct marketing (flat) campaign to pre-announce launch of new notebook computer to existing Dell corporate customers. Series of pieces in standard business envelopes with notes written on outside, as if from a spy inside Dell. Each envelope contained a different piece that the ‘spy’ had acquired which contained information about the soon-to-be-released Dell notebook computer. Pieces included a daily calendar sheet taken from a Dell executive’s daytimer; a menu with notes on it from a fictitious Italian restaurant named “Luigi’s” where Dell executives were lunching and discussing the new notebooks; a page of secret notebook information pulled by the spy from a paper shredder at the last minute (page was delivered pre-shredded in envelope); and a crumpled transcript, pulled from a waste basket, from a high-level meeting on notebook features. Final piece was a simulated news report that the spy had been captured. Web-based multimedia sales promotion/incentive site. Requires the Flash plugin. 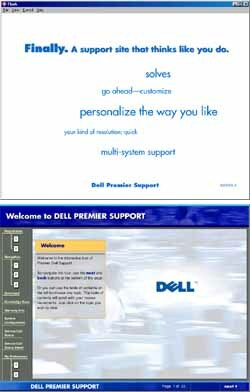 Direct marketing catalogs for Dell Computer Corporation. Executable multimedia file (2.1MB) from an educational CD-ROM. Download to your desktop and double click to run it. This file was designed to run on PCs.